October 17 is National Boss’ Day. Celebrate the unconventional holiday with an unconventional breakfast – Fractured Prune doughnuts. With over 150,000 possible combinations, you are sure to find something even the most peculiar boss will like. For the special day, Fractured Prune is giving away a free 2-pack or 16oz coffee with the purchase of a dozen doughnuts. You can come in and create your own special doughnut, or pick from our mouthwatering selection of specialty doughnuts. Does your boss have an undying love for chocolate? They’ll love the Morning Buzz, complete with mocha glaze and cookie crumbs. If your boss prefers the simple things in life, there is nothing better than the Plain Jane, a naked doughnut without any extra frills. Make this National Boss’ Day one to remember! A little brown nosing never killed anyone, especially if it is chocolate! The Fractured Prune® has been an Ocean City, MD landmark since 1976. It has been a tradition for many doughnut lovers far and wide. These doughnut lovers line up in the early morning, around the block in the anticipation of creating and tasting their own creation. 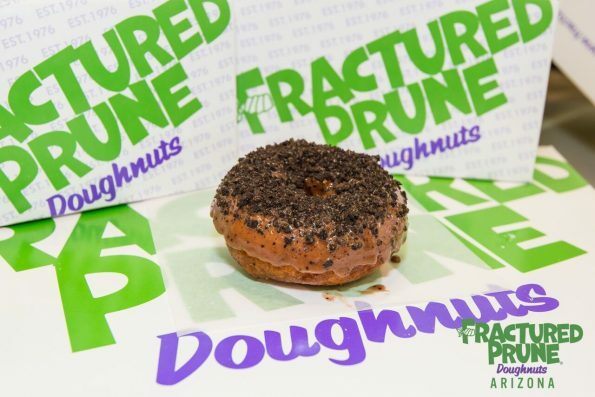 Fractured Prune has 8 locations in Arizona, in Tempe, Phoenix, Chandler, Gilbert, Glendale and Flagstaff. They also have a Las Vegas location coming soon!